Woolfson, E. (2008). Corvus: A Life with Birds. Granta Books; London. If you’ve ever walked past a wild animal and wondered what it’s like to have that creature as a pet, this is the book for you. Esther Woolfson’s life changes when she begins taking in fledgling birds of all shapes, sizes, and sounds, living in an often tenuous peace with birds both sensitive and aggressive. “That spring, my daughter Hannah was still at home, in her last year at school. When she arrived back, we took the magpie out of his box. His eyes were not yet black. They were grey, fringed by dark, feathered eyelashes. ‘We can’t keep him, you know,’ she said, bowing to the good sense that told us both that we had enough birds to look after, that if there was an alternative to keeping him it should be sought. We both knew that we would not find it easy to part with this enchanting bird. After our conversation, I phoned Kevin the bird man who, years before, had so sagely and with such success chosen a suitable mate for my bereaved and grieving dove. We discussed the matter of the magpie” (Extract from The Telegraph). “Hardly a page passes without Woolfson watching her rook and saying “I don’t know why she does this or what it means”, and while these admissions of ignorance are touchingly modest they rather encage her book. These uncertainties are actually ways of saying: I love this pet and I cannot explain my love. 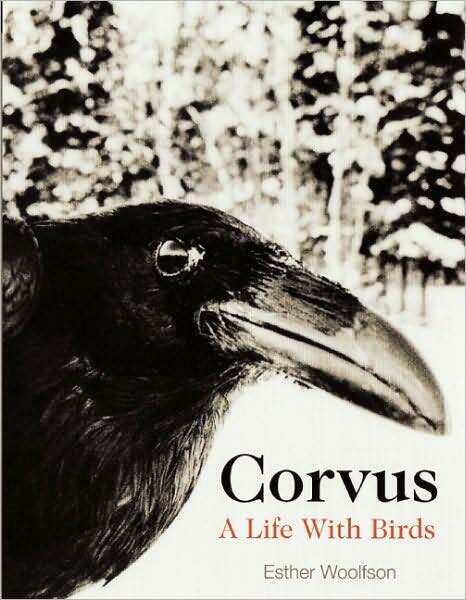 Corvus is an account of keeping an inexplicably loved thing, not a book about rooks” (Dee, August 2008). If you wish to enjoy some interesting stories about living with multiple birds, learn a little about the history of human perspectives towards birds, and engage in a philosophical debate about the keeping of wild animals, Esther’s book is sure to please. However, do not turn to it expecting any scientific accuracy or insight on the behavior of corvids.